Cute little top, isn't it? The style reminds me of an Anthropologie blouse I've worn about 100 times. I like how it turned out, but, there's a little problem..... I have no range of motion in my arms. More below. 50% silk/50% cotton batiste from Gorgeous Fabrics. This fabric is sheer (as batiste is known to be!). I knew I'd have to line or underline this fabric in order to make it wearable. It figures that the one month I choose the pattern that is the special "sewing course", I decide to change up the construction enough that I really can't follow their directions! Well that's not entirely true, I did read through them quickly for a general idea of how to do things, and the pictures were helfpul when it was time to attach the center tab and gathered band. The pattern calls for the neckline to be faced. I am not a big fan of this kind of neckline finish to begin with, and it wouldn't be practical anyway with my sheer fabric. 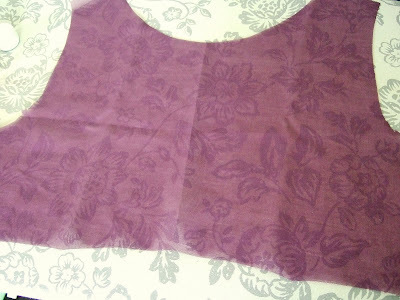 I decided to self line the blouse with the fashion fabric - make 2 bodices, sew them right sides together at the neckline, and flip - this finishes the neckline at the same time. I briefly considered stabilizing the neckline since much of it is cut on the bias. But, I was feeling lazy and so I told myself I'd be "real careful" not to stretch it. Bad idea. It stretched out. I also used a double layer of fabric for the sleeves. Same idea - stitched them right sides together at the hem, then flipped so wrong sides were together. I learned a new technique! Tany made a sheer blouse a while ago and described how to sew a "single thread dart". This technique comes from page 74 of Roberta Carr's book, Couture: The Art of Fine Sewing; Carr describes this as ideal for sheer fabrics as there are no thread tails. This was my first time trying single thread darts and they are very easy! The gathered band that is under the bust is cut on the bias. 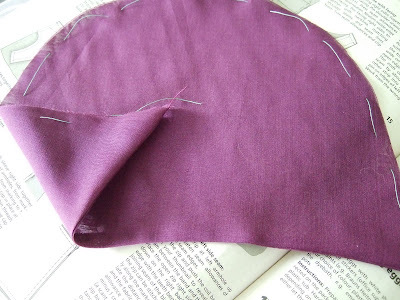 The bias cut is important here - it allows the band to stretch snugly under the bust. I finished the bodice and lining hems separately with baby hems. So....the sleeves. Yes, they are super cute, so perfectly gathered and shaped around the shoulder. Regrettably, this oh-so-sweet shaping causes your arms' range of motion to be very limited - when you lift your arm, the hem of the sleeve cuts into your arm. I think you can kind of see this in the model photo. You are gonna need to style your hair and makeup before putting on this blouse. consider the sleeveless version (model 110) instead! Besides the limited range of motion thing, I really do like this pattern! The center tab and gathered band are easy to do and really add something special to the top. Gosh! It's so cute! Really, though, the sleeves, argh! What if you're trying to hail a cab or have to grab the rail on the bus.. I guess you're right, only if you just want to stand and look pretty. This top is so cute, and yes, I absolutely must make it! It was the first thing that I noticed when I leafed through the magazine. After reading your post I am glad I already decided on the sleeveless version! Hi, your top is very beautiful !!! When I first saw it in the magazine I didn't paid it any attention but seeing your's make me want to try it . wow, is that ever cute! Great color and looks terrific on you. Christina, your top is ultra cute! This colour looks so good on you, by the way. Oh gosh I love that sheer fabric's color. It turns out great! Your version is so much nicer than BWOF's one, well done! Beautiful blouse and the fabric is lovely. So sorry about the sleeves. It's beautiful. This was the one non-wedding thing I liked in this edition. Now, how would you have stablized the neckline given that it's a sheer fabric? Inquiring minds want to know? You look a picture in that sweet top and the colour is perfect on you. I agree the plain sheer is so lovely. I really think sheer doubled this way is such a wonderful idea & ( I agree ) is much nicer than adding facings. The sleeves although cute are going to be a headache.They usually are when they join 3/4 of the way to the armhole ( not much room like a normal sleeve !!! ).You are right when you suggest a stretch woven or a knit. The satin version in the magazine looks like it has some stretch in it too. Would pivoting in a bit more area into the sleeve hem edge help? It's definitely worth making up again as it's a great style on you. Well done. That is really fabulous, well worth suffering a bit of restriction in movement for! Thank you for the helpful tips on making this pattern. The fabric & colour are gorgeous too. Besides the sleeve problem: This is such a super cute top! I love the fabric and the colour! What a great top! It does look very Anthropologie-esque. And I hope the sleeves won't be too much of a bother, because it's too pretty not to wear. It is really very cute. Is there a zipper or you just pull it over? Who needs to move their arms when you look so cute in a top like that? ROFL. Thanks for all the great suggestions on this one! This top looks great on you - I just picked up Burda the other day and was thinking about making this my first Burda project since it is the project featured in the sewing course...perhaps I'll make the version without sleeves! Sorry about the sleeve issue, but I must say that you rock at standing around and looking cute! Cute top! That's too bad about the sleeves. I like your suggestion to use a knit fabric. Lovely shirt and color. It reminds me a little of the Simplicity 3867 top. Oh super cute top, but what a bummer about the sleeves! Do you think you have a bit of a forward shoulder that causing the problem? I rarely make a forward shoulder adjustment on knit tops tho I know I probably should, but on woven tops I have to as the sleeves fit wrong and I don't get the full range of movement I need. Just a thought. I hope you find it wearable as you look so cute - I adore the color too! Everyone - Thanks for taking the time to comment! 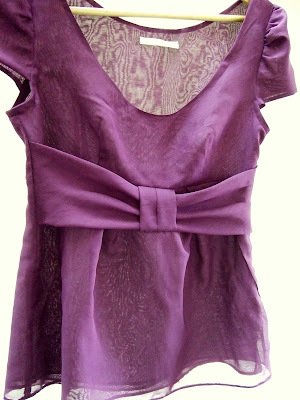 Cidell - To stabilize the neckline given the fabric is so sheer.. 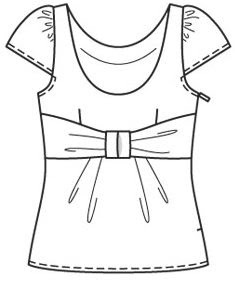 I think you could cut a strip of organza, or selvedge from the fashion fabric, baste this on the sewing line, then trim it after the neckline is sewn. Geri - Sorry I didn't show it, yes there is an invisible zipper in the left side seam. Melissa - I could very well need a forward shoulder adjustment given how much time I spend hunched over at the computer... That may help a bit - good idea. Oh my gosh, that is so cute! Love the fabric! I so hope I one day have half the talent you do! Great top once again. BE-AU-TI-FUL!!! This top goes straight into my spring project list! Well done Christina! 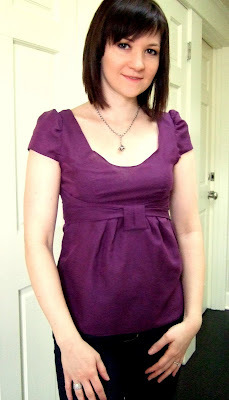 We seem to have similar likings in clothes because you always make my favorite Burda items! This top is beautiful, I love the fabric, the colour is to die for and it looks gorgeous on you! I hope this does not become a double post as I sent one late last night. I love your top and the color; so cute on you. That said, there is absolutely no reason why you cannot alter that sleeve pattern to fit. You have a basic cap sleeve; really just a shorter version of a regular short sleeve without the bottom. All you need to do is take your pattern and slash in 3 places through the hem and up to but not through the seam allowance along the cap of the sleeve. Spread the bottom about 1", which is about 3/8" each section, insert tissue or paper and tape. I love the idea of cutting on the bias fold. A recent issue of Threads (March 2008, #135) has an article about bias cut sleeves. This should reduce the strain on your sleeve, not affect the style at all, and if not enough, you can spread the pattern some more. I think this top is cute enough that if you have enough fabric left over, it would be worth taking out your sleeves and redoing them. If not, make another with your altered sleeves. The top is darling, and PatsiJean has a great save for it. Your top is too cute. I kiked that top too. You did a fantastic job. You DO look cute indeed!!! I always make sleeves in a larger size than the top or dress. This is very easy to do if the pattern is multi-sized. The other more expensive option would be to get another larger size pattern, of course. I think I may have even put size 14 sleeves on a size 8 top, just to have the ease and fit I like, because I can't stand the restrictive feeling of tight sleeves. The top is beautiful and I enjoy your blog. I just thought of something else that works for me: just switch with a different pattern that has a fuller sleeve style, as long as the cap is compatible.